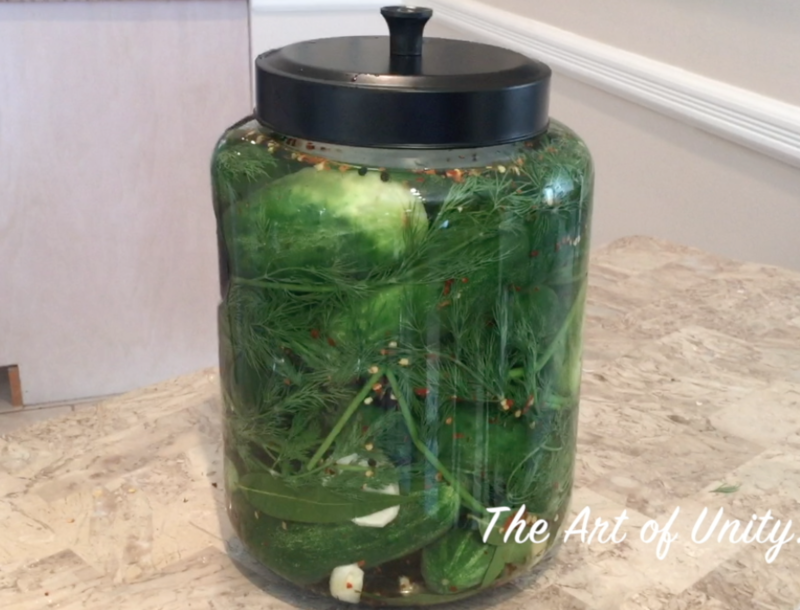 The reason I make these the old fashion way (without boiling the water or adding vinegar) is because the purpose of this is not just for a great tasting kosher dill pickle style pickle, but to grow good gut bacteria or probiotics. For more fermented foods also see how to make Kefir, Water Kefir, Fermented Vegetables, and Kombucha (coming soon). These fermented foods, promote the growth of friendly intestinal bacteria, aiding digestion and supporting immune function, including an increase in B vitamins (even Vitamin B12), omega-3 fatty acids, digestive enzymes, lactase and lactic acid, and other immune chemicals that fight off harmful bacteria and even cancer cells. These benefits only apply to homemade pickles prepared this way through fermenting, not commercial processed pickles. See my blog here to learn the many benefits of probiotics foods rather than taking probiotics supplements for your digestion and overall health. Fermented foods have increased nutritional value The fermentation process increases certain nutrients, such as increased vitamin C content in sauerkraut, and many others fermented food show a big jump in vitamin content. Pulque, a fermented plant sap has increased thiamine from 5 to 29 and niacin from 54 to 515! Just from fermenting. There is a lot of evidence that the fermentation process actually enriches foods with higher amounts of nutrients. Source Fermented foods are more digestible More than just probiotics, the fermentation process actually makes the food more digestible to us by breaking down hard to digest cellulose in food. Because so many of us have digestive issues, fermenting our foods could give our bodies a head start in the digestion of our food, while feeding our healthy gut bacteria at the same time. The simplest way is to just put the cucumbers in a jar with water, sea salt, garlic and dill. From there you can flavor it anyway you like. I like mustard or pepper seeds but you can use so many different spices, the easiest is pickling spices. Make a brine by mixing 2 quarts of chlorine-free water and 5 tablespoons sea salt. Mix well and be sure water is cool to room temperature. Preparing the pickles in cold water will keep them crunchy. Cut the ends off the pickles that are sprouting (These contain an enzyme that will soften the pickles. Then add a few cloves of garlic, the heads of dill, and 1/3 of the spices you plan to use. Repeat a layer of leaves, garlic, and spices. Add another tightly packed layer of cucumbers and top them off with more garlic and spices. Pour the brine over the pickles, leaving 1 to 2 inches of headspace. 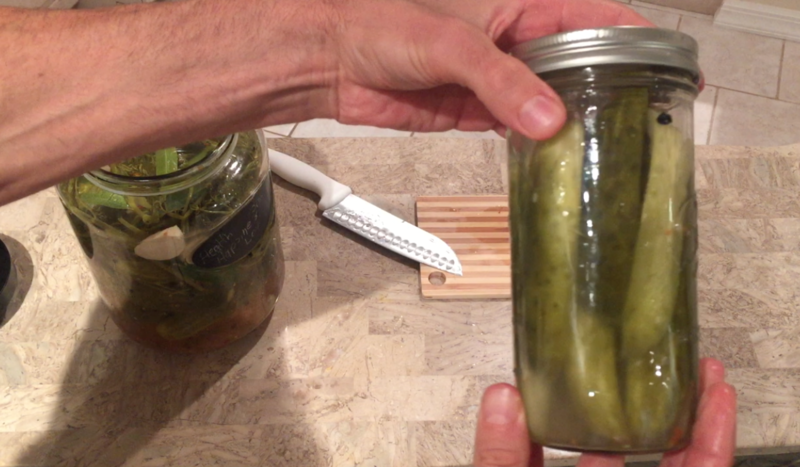 Place more tannin-containing leafs on top of the pickles as a cover between the pickles and the surface of the brine. After everything is in there tap or shake the jar to get any air bubbles out of there since they can cause mold. Weigh the cucumbers down to be sure they don’t rise above the surface of the water. Cap the jar and place in a safe spot at room temperature for 3 days to 3 weeks. You will know your pickles have fermented when the brine is cloudy, the brine has stopped bubbling, and the pickles have a bubbly sour taste. The warmer the fermenting temperature, the shorter the fermentation time, though a cooler fermentation temperature is desirable (less than 80°F). There will be some mold on top and you can just remove that but don’t worry that won’t effect the pickles since they are under the water fermenting anaerobicly. If you’re using a jar that seals such as mason jars burp the jars every day or two since the fermentation produces carbon dioxide. For a similar strong typical pickle taste, depending on your temperature, I recommend fermented between 2 and 4 weeks, and that’s based on your taste as well. After that they are fully sour or the way you like them you can bring them to the fridge with the brine and they will last for months. If you like the taste less salty, after fermenting put them in a jar with more pure water added than brine. You can do this same process with cauliflower, carrots, cabbage, onions, and other vegetables. Regarding Vinegar – it is not necessary for lactic acid fermentation and some find it to be a hindrance. The acetic acid in the vinegar can often overwhelm the lactic acid that needs to proliferate in order for a true lactic acid fermentation to take place. Great to hear Claudia! Thanks for saying, glad you like it! a nice write up on why people should go back to fermenting their own foods! Yes, I agree. Thanks for saying!